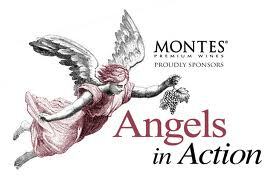 Montes Wines and its distributors in nine states conclude their month-long “Angels in Action” fundraising program, donating a portion of September’s wholesale proceeds to the charity. Just in time for the holidays, Montes Wines of Chile announces it has donated $50,000 to the Cystic Fibrosis Foundation in an effort to help support life-changing research for children and adults affected with the disease. The donation results from “Angels in Action,” a joint fundraising effort by world-renowned Chilean winery Viña Montes and its U.S. distributors in nine states. Beginning with a fundraising kick-off party in June, the program raised awareness and support for the fight against cystic fibrosis. The in-store campaign took place in September, during which Montes and its distributors jointly donated a portion of all wholesale proceeds for the month. “We are so grateful to our long-time partner, Viña Montes, for developing the “Angels in Action” campaign. It is reflective of their commitment and passion for the Foundation’s mission to find a cure for cystic fibrosis,” said Richard Mattingly, Executive Vice President and Chief Operating Officer of the Cystic Fibrosis Foundation. See clips from the June 7 kick-off event and learn more about “Angels in Action” at http://youtu.be/tIVDkLUeX9E. Founded in 1988, Viña Montes is the brainchild of Aurelio Montes and Douglas Murray, both veterans of the wine industry. Along with partners Alfredo Vidaurre, Pedro Grand the Garces and Barros family, they created Viña Montes with the goal of elevating the quality and reputation of Chilean wines – both in Chile and around the world. In the quarter century since, Viña Montes has played a pivotal role in enhancing awareness, affinity, and acclaim for Chilean wines in more than 100 countries worldwide. In essence, Viña Montes has become the benchmark for premium Chilean wines.